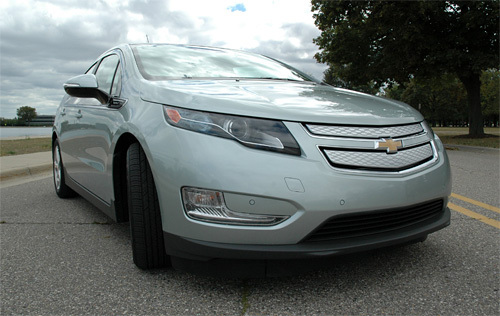 Hands-On With The Chevy Volt | OhGizmo! By Andrew Liszewski on 09/13/10 • Leave a comment! 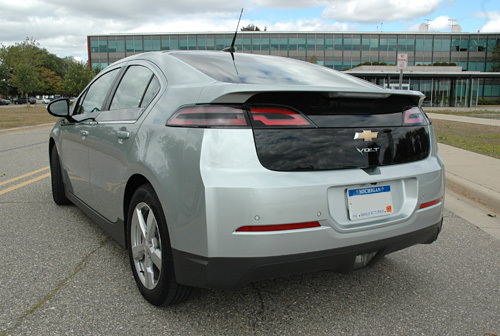 Even though cars aren’t really our focus, we’ve been covering the Chevy Volt’s progress for over 2 1/2 years now, and as we inch closer and closer to the vehicle’s official release date, it’s become clear that the car is going to have a much wider appeal than to just those looking for an eco-friendly alternative to their daily commute. 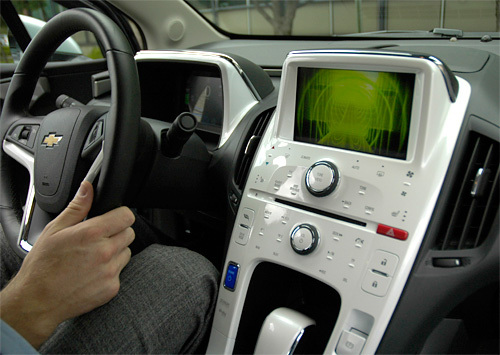 In addition to developing the technologies that make the Volt’s electric propulsion and extended range capabilities possible, General Motors has also used the Volt as an opportunity to advance how a driver interacts with their vehicle. In the same way the iPhone changed how we all interacted with our cellphones, the Volt has the potential to do the same for the automobile. 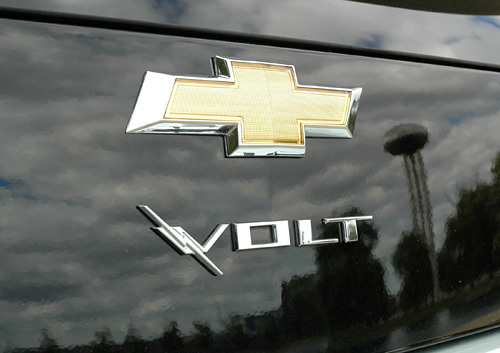 And in the same way the iPhone has become an important tool to draw new users into the Apple fold, I think the Volt will do the same thing for General Motors as the company rebuilds after their bailout. So after reading and writing about the Volt for years now and seeing it progress from the original concept to its more practical current form factor, it was a surreal experience to finally be able to climb into the driver’s seat, hit the power button and pull away in almost complete silence. But while I was only able to spend a limited amount of time exploring the vehicle recently, including taking it for a short ride, I did walk away with quite a few impressions of what many believe is the car that helped save the General. More after the jump. It hasn’t even reached the consumer yet, but already public opinion on the Volt is very divided. It has its ardent supporters with dedicated blogs that have been covering every detail of its development, and its detractors who think that GM has simply gotten it all wrong and the car will be a total failure. 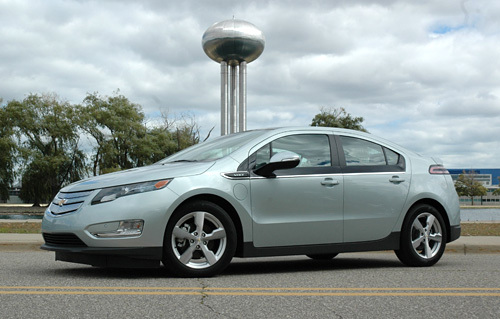 Time will certainly tell, but one of the most heated debates erupted when the production version of the Volt was finally unveiled. 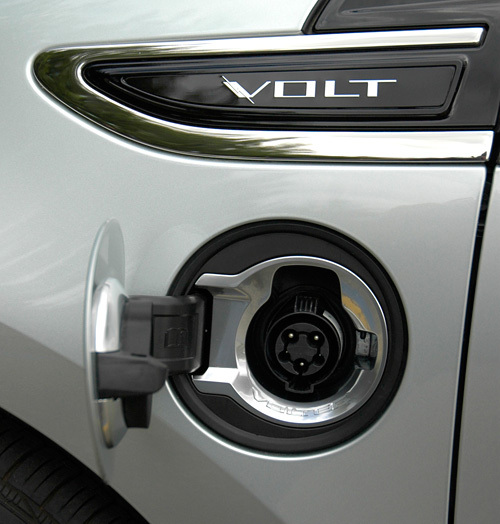 It was a far tamer and more conventional design compared to the Volt concept that had been touring auto shows for a while, and many felt that it was simply too boring for a vehicle that aspired to be the future of the automobile. But when I look at the current Volt I don’t see a missed opportunity to create some radical re-imagining of the automobile. Instead, I see an extremely practical vehicle that’s been designed to squeeze every last inch out of the battery and fuel tank, and appeal to every driver on the road. Not just those looking for a car to turn heads or show everyone they’re an early adopter. 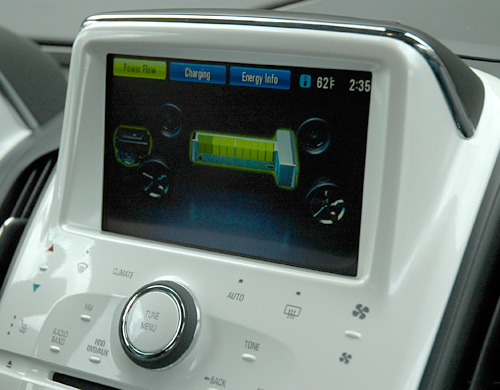 As Dave Lyon, the company’s Executive Director of North American Interior Design expressed to us, the Volt couldn’t be a complete science experiment. It first and foremost had to be a practical way to get people from point A to point B using as little fuel as possible. And I’m not going to pretend that the Volt will be the most eye-catching thing on the road either. It has some ‘unique’ design cues that seem to have been sampled from a handful of vehicles in GM’s current lineup, which is probably a good thing since the Volt almost sums up the company’s rebirth. But even though I don’t see the graceful swooping lines of a Porsche or a Ferrari, I still get excited when I look at the Volt knowing what it’s got on the inside and what it represents. But I can understand why those who were hoping for a futuristic looking vehicle that would turn heads might be disappointed. 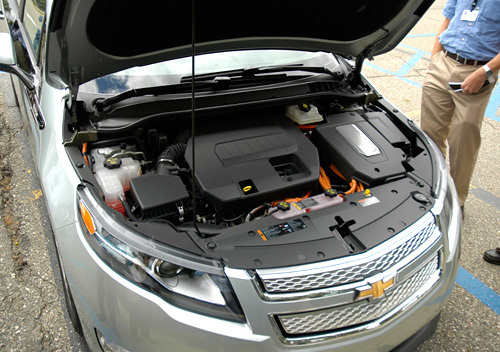 Even under the hood the Volt looks like just another car to the untrained eye. And most people probably wouldn’t even notice the additional ‘fuel’ hatch located just in front of the driver’s door which hides the Volt’s charging port. 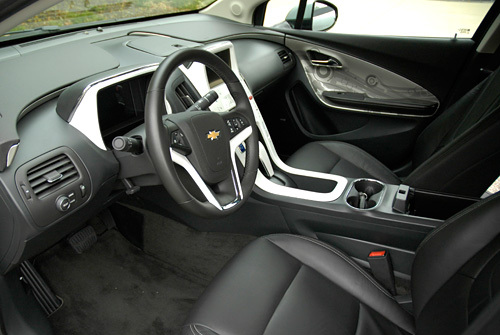 Even when you first peer inside the Volt it looks just like your average 4-door car, but once you slide into the driver’s seat it will be hard for the gadget lovers not to crack a little smile. Where you’d normally find the vehicle’s speedometer, odometer and fuel gauges is a large 7-inch LCD display that provides considerably more information, and quite frankly looks a lot cooler. And your eyes can’t help but be drawn to the tall, gleaming-white center console which serves as the focus of attention for everyone in the vehicle. 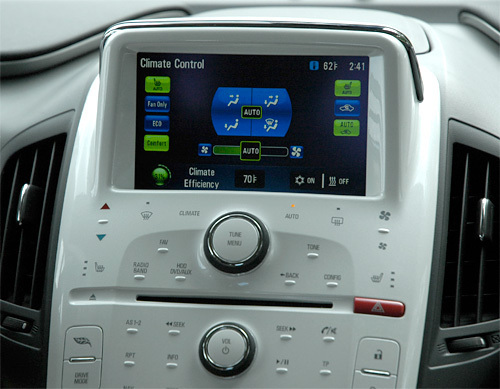 It’s got its own 7-inch LCD display, though with touchscreen capabilities, and a sea of touch-sensitive buttons below it. I will admit having seen photos of the center stack before I was actually a little hesitant about how well all those buttons would work. You see when you press a ‘button’ on a touchscreen display it usually provides immediate visual feedback that it’s been pressed. But with buttons like this there’s usually no feedback, like when pressing the glossy touch-sensitive buttons on the back of the 2nd gen Flip MinoHD. You’re never really sure if you’ve pressed it properly, and it drives me crazy! But thanks to a nicely textured finish, small bumps and subtle sound effects, the touch-sensitive buttons on the Volt’s center stack work like a charm. 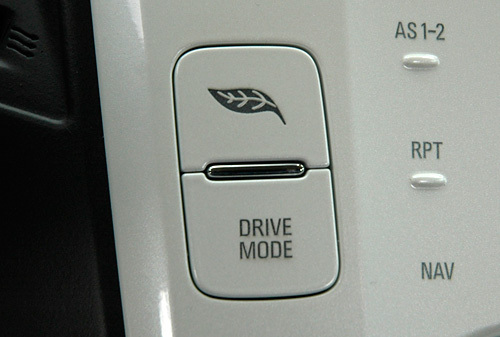 There’s also a small set of physical buttons for changing or activating important functions like the Drive Mode, and a set of dials which are still the easiest way to scroll through music tracks, menus or adjusting the stereo’s volume while driving. 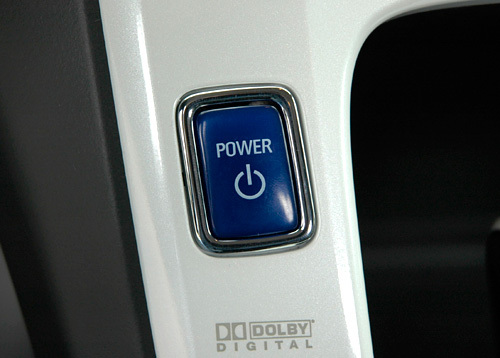 Not to mention the all-important and dead simple Power button which brings the Volt to life or shuts it down. 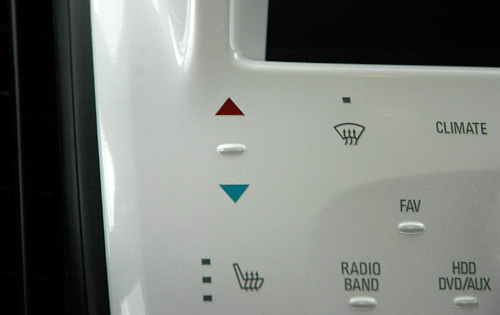 I also really like the simple fact that the temperature control buttons are color-coded blue and red for cooler and warmer. In a sea of white buttons with gray logos and labels it makes them a lot easier to spot with a quick glance while you’re behind the wheel. 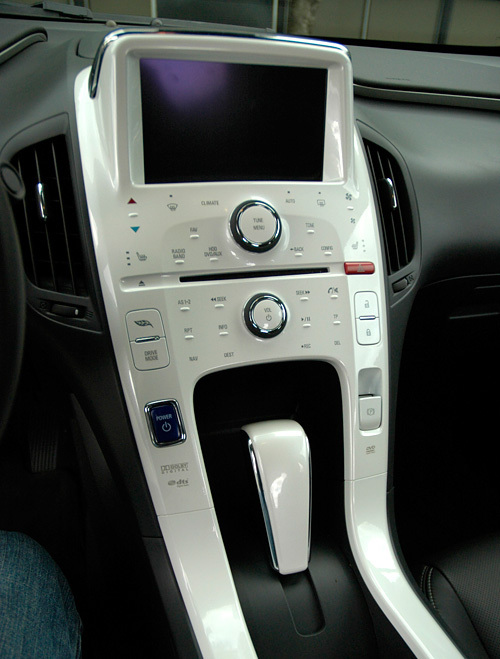 But it’s those dual 7-inch displays that really give you the impression you’re sitting in a next generation vehicle. I mean we’re not talking The Jetsons or Bladerunner, but certainly more advanced and more developed than pretty much every other vehicle on the road today. During my time with the car I was fortunate enough to be given a walkthrough of the Volt’s UI by Stuart Norris, the Design Manager of GM’s User Interface Studio (pictured, at least his hand and knee) and it’s clear the company has put a lot of development into not only making the displays easy to use, but to keep them informative without being overwhelming. First of all they look fantastic, with deep blacks and excellent contrast levels that never got washed out in the daylight during my testing. (Though admittedly it was a rather overcast day.) The green and blue color palette definitely contributes to the next-gen feel of the system, and as you transition between settings or different modes there’s plenty of subtle animations as gauges and infographics appear and disappear. 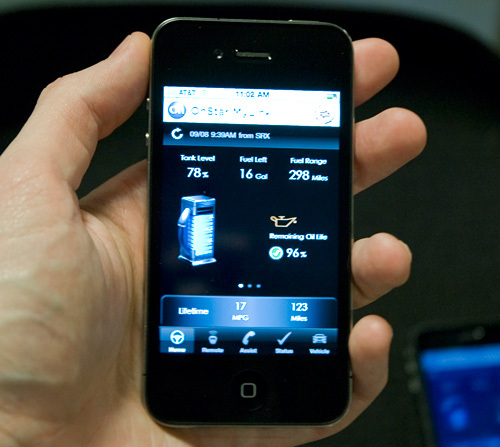 While they spoke to us about the development of the Volt’s UI the iPhone definitely came up as being one of their sources of inspiration, at least in terms of usability. But when you see the displays in action you never feel as if they ripped off Apple’s designs. They feel genuinely original and unique to the Volt. The displays can also be customized to a certain degree if you’re an information junkie or prefer to mimic what you’d see behind the steering wheel in vehicles of yesteryear. Pictured here is the Volt’s ‘Powerflow’ infographic which uses subtle animations to show the flow of power in the vehicle while you drive and the battery’s current charge level. For the most part it runs one way while driving, but when braking you’ll actually see power flow back to the battery thanks to the Volt’s regenerative braking system. It’s all very slick I must say, but it’s not all just eye candy for the sake of eye candy, it’s also quite powerful. For instance, one of the biggest things Volt owners will have to get used to is recharging and plugging in their vehicle every night. But these days there are a lot of power companies who charge premiums depending on what time of the day you’re drawing electricity. And no one wants to go out in the middle of the night to plug in their car just to save a little money when power is cheap. So VIA the Volt’s UI you can actually set up and limit charging schedules, or simply just let it know when you intend to drive the car next, and it will hold off recharging until a few hours before the vehicle is needed. Now I haven’t spent a lot of time with the Volt yet, but so far it seems like its designers have tried their best to think of everything. I particularly like this screen you get at the end of a ride. 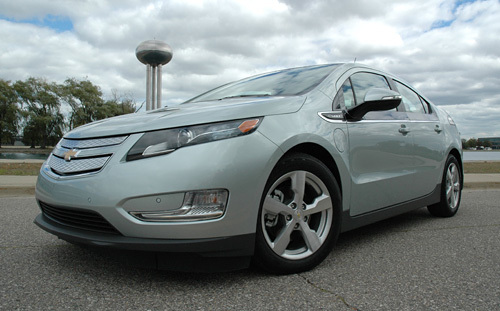 A big part of the Volt’s electric driving range will depend on how efficiently you drive it. Accelerating too hard will drain the battery quicker, and slamming on the brakes is a poor use of the regenerative braking system. So here you’re shown just how many MPG you got during your last excursion, which almost serves as a high score you can strive to beat as you become better and better at properly maxing out the Volt’s electric range. 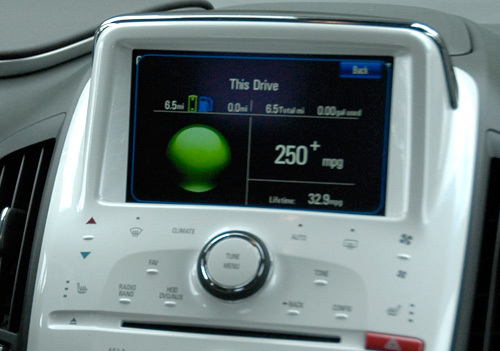 And let’s not forget the accompanying iPhone and Android app unveiled at CES earlier this year that rely on GM’s OnStar system to provide access to a lot of the functionality included in the Volt’s UI, like monitoring battery levels and setting up the charging schedules, to even remotely opening the doors. There’s no doubt in my mind this vehicle is going to appeal to the gadget-loving or ‘bleeding-edge’ demographic, but what’s great is that none of this feels like it was tacked on at the last moment just to increase the Volt’s appeal. It all works and fits in seamlessly. But most importantly, how is it to drive? Well I’m afraid I can’t draw any concrete conclusions without spending more time with the Volt, but it’s definitely an experience. When you first get it in and power it up the roar of the engine is replaced with an animation of all the on-screen elements flying in, and a clever but satisfying sound effect of everything locking into place. I think it will take a lot of drivers a while to get used to, but it’s a nice alternative to the whine of a starter motor. And of course you get the opposite when powering down the Volt, but again, it’s all these little elements that give the vehicle the feel of being well thought out. Backing out of a parking spot revealed another appreciated feature when the back-up camera was automatically activated. Not only do you get to see what’s behind the vehicle on the center stack display as you reverse, but an overlaid grid shows the projected path of your vehicle, even warping to the left or right as you turn the wheel. But besides extra features like that, the overall quietness of the vehcile and the lack of engine vibration, the Volt pretty much feels like your standard vehicle, which is exactly what the average consumer is going to want. Now obviously it doesn’t provide the same thrills as hitting the road in a Porsche, but I have to say once I was encouraged to put the Volt into ‘Sport’ mode you could really feel the electric motor’s torque come into play. It’s not going to post 0-60 times comparable to a high-end sports car (it’s around 8 or 9 seconds I believe) but the feeling of being pushed back into my seat when I hit the accelerator was enough to put a small smile on my face. The ride was completely smooth too given the lack of shifting, though unfortunately even though the pre-production test vehicles on hand were almost drained by the time we were done playing with them, I didn’t get a chance to experience what it was like when the extended range gas engine kicks in. But so far I’ve heard that it’s barely noticeable and is completely automatic as it should be. I’m sure we’ll hear more as people conduct longer road tests closer to the Volt’s release, but I’m confident it will work as well as GM promises it will. They’ve got a lot riding on it after all, literally and figuratively. A lot has been said about the Volt so far, both good and bad, but even after only a brief hands-on I’m convinced that General Motors has produced an electric car that consumers will not only want, but actually need. It’s not quite as futuristic an automobile as many had hoped, but I genuinely think it’s the perfect transition vehicle as we move towards an all electric future. Yes, there are other electric vehicles from other manufacturers that will provide a larger electric-only range than the Volt’s 40 miles, but even the 100 miles promised by the Nissan Leaf is still limiting for a lot of people, particularly in a country as large as the US. It’s more than enough for a daily commute or running errands, but visiting my closest family is a 230 mile trip, and I don’t want to have to own a second vehicle to facilitate longer drives, nor does the average consumer I think. GM has put a lot of time and money into the development of the Volt’s electric battery (even before their bailout) but at the moment it’s still limited. The same way I have to charge my iPhone every night. And while I’m sure their skunk works is already hard at work on the next generation of their battery tech that will be considerably improved, we’re still far off from the technology needed to give a practical electric car the same range as current gas powered vehicles. On top of it all it still takes about 4 hours to completely charge the Volt under ideal conditions, so even if there was a reliable network of charging stations around the country, charging on the road is still impractical. So I’m convinced that an electric vehicle that can fall back on a gas engine (that only serves as an electric generator in this case for those who don’t know) is the ideal solution for the time being. It gives consumers an eco-friendly option without them having to completely change the way or limit how they use their vehicle, and without a doubt that’s the most important feature the Volt provides. But don’t let me give the impression that I think the Volt is perfect, because there are endless ways it can be improved. The T-shaped battery running down the middle of the vehicle means you’re limited to 2 seats in the back instead of a 3-person bench making it impractical for growing families. And of course there’s the price tag which comes in at $33,500 even after a $7,500 tax credit. But since it’s a credit you’ll still have to pay the full $41,000 for the Volt when you eventually get your hands on one. That will definitely deter a lot of buyers. Even still I don’t think GM will have any trouble selling the Volt as quickly as it rolls off the assembly line, and once the economy of scale kicks in the price will hopefully drop to the point where it will be a viable option for almost any car buyer. However, even taking those issues into consideration, I still think the best way I can sum up the Volt so far is to say that the iPhone 4 officially has some tough competition when it comes to gadget of the year. And if for no other reason than it’s been stuck in my head the whole time I’ve been writing this article, I’ve included the video for They Might Be Giant’s ‘Electric Car’ which almost seems like it was written as the perfect commercial jingle for the Volt.